Have you heard about the word 'Selfitis'? 'Selfitis' is the obsession of taking selfies on smartphones. Social Media has a selfie overdose. Studies indicate that Selfitis may be a real disorder. If you love clicking selfies, then these factors govern your behaviour too. India ranks number one, with the distinction as the country with the maximum number of selfie-related accidents that occur throughout the world. India recorded the world’s highest number of selfie deaths, accounting for more than 60 per cent of reported fatalities. This is a dangerous trend indeed. The Ministry of Tourism, Govt. of India, has advised all states and union territories to identify tourist attractions, which are prone to accidents and erect signs warning visitors of the dangers involved in taking selfies at such spots. Clicking a selfie at 'Sunset point' or 'Echo point' or 'Suicide point' is a bad idea. The Govt. wants to prevent incidents by setting up "Selfie Danger Zones" or “Selfie Restriction Zones” at tourist sight-seeing locations. But, the question is- Will the selfie-crazy public follow the guidelines/warnings? 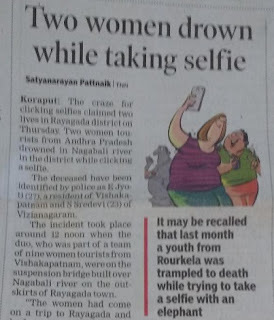 What is worse is that some people will go to any lengths for a selfie; whether it is for a selfie with a celebrity or a selfie with a foreigner. Imagine the pursuit for selfies just to show off or brag on Social Media! At CII’s annual tourism summit International Year of Sustainable Tourism for Development in New Delhi in December 2017, Tourism minister, KJ Alphons, said that asking foreigners for selfies is an intrusion to their privacy. Selfie insistence by locals had caused some attacks. What impression does such selfie hooliganism portray about us and our culture? Does our love for selfies exceed our responsibility towards our nation and our guests? Our life and dignity is more important than a selfie. High time the world understands this. Do you find an obsession & overdose of selfies in Social Media these days? Why do you feel people love clicking & sharing selfies?Are you #SelfieCrazy? Do share in the comments below. An important article and a must read one. This article should be forwarded to college and secondary/high school students as the selfie craze is high in this group. The mounting obsession with selfies can be a serious threat to humanism. I feel that over the top selfie can be dangerous and we tend to over to do overlooking hazards where we might meet up with accidents. Shabana Azmi is someone who is dead against selfie and laud her. Selfie has robbed the joy of being natural in front of camera.